As we wrap up another packed and productive semester, we are grateful that Alchemy is here to keep track of the many research and creative activities, community engagement initiatives, student accomplishments and serendipitous teaching and learning moments enjoyed by faculty, staff and students in the Faculty of Humanities and Social Sciences. Congratulations to everyone on a most rewarding and inspired academic year in FHASS. We look forward to celebrating the unique achievements of our students at our annual Awards Ceremony and to congratulating our graduates at Convocation Ceremonies this Spring. 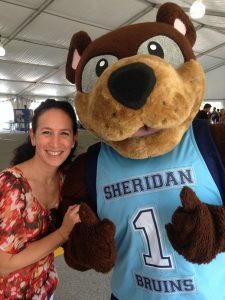 In the meantime, may we all breathe a sigh of relief that, in spite of a crafty April Fool’s joke unveiling a presumed alternate mascot for Sheridan, Bruno the beloved is here to stay! He will be around to spread the cheer, welcome new students and witness the launch of exciting new programs across our campuses in the Fall.